High pressure gauge kits - Borosilicate and quartz glass, mica, sealing, level gauges, armature - Continental Trade. When the operating conditions (high pressure, temperature, aggressive environment, risk of explosion) does not allow the use of the "normal" gauge glasses, shall apply special high pressure liquid level indicators, characterized by massive construction and using modular elements for viewing (ports) - called high pressure gauges kits. High pressure gauges kits are components of liquid level indicators designed to operate at high pressures (over 200 bars). They have a modular structure - made up of a number of interconnected viewing ports joined with durable housing. The figure on the right shows an example of a high-pressure liquid level indicator - color Yervay PG-60. By installing additional equipment (not shown) obtained colored (green / red) to display the level depending on whether we are dealing with steam or water. This causes the reading ie. boiler water level, is contrasted. Through the use of additional fiber optic hardware readings from each port can be transmitted at a distance, ie. to the control room placed at a safe distance from the high-pressure tank. Individual viewing port has the same construction, as shown in the figure to the right. In the massive housing, mounted to the gauge body by two or four screws, there is glass, mica shield and a set of seals and springs. A thin sheet of high quality mica on the inner surface of each port protects the gauge glass from corrosive attack of steam, water and alkalis; however, this protection is not permanent. 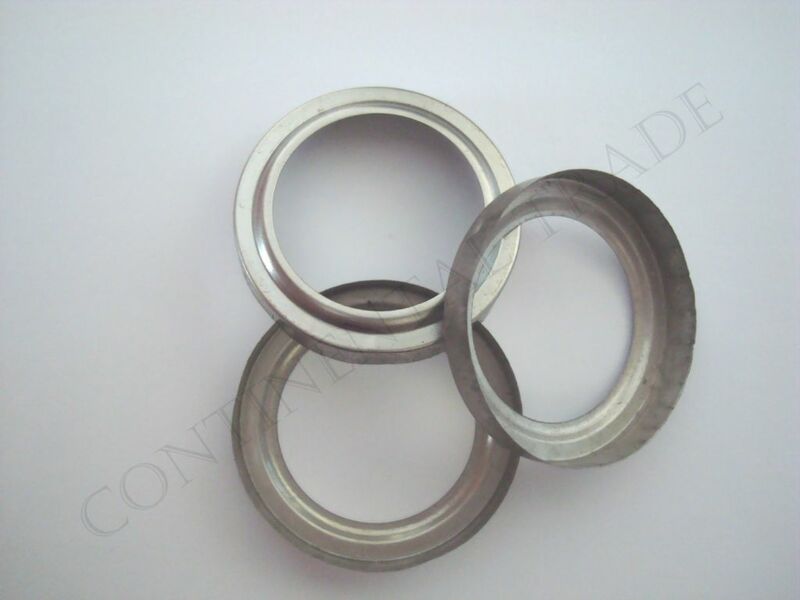 Continual exposure to high temperature, high pressure water will also corrode the mica shield. The rate at which this corrosion occurs is significantly less than that of glass, and is dependent upon a number of factors. Generally, the higher the operating temperature, the higher the rate of attack (see ie. graph erosion borosilicate glass Suprax 8488 shown here). WARNING: Replace immediately when glass appears white or opaque. 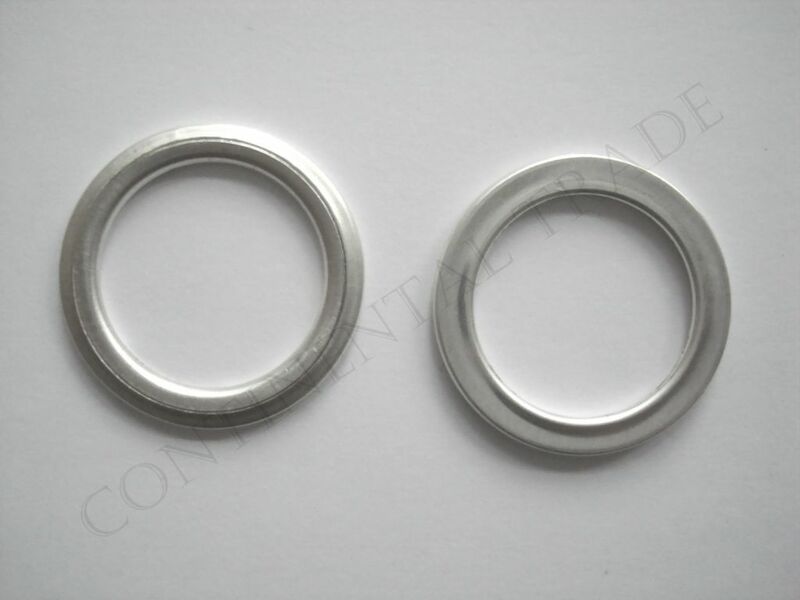 Failure to promptly replace the mica-gasket-glass assembly that appears white or opaque can result in catastrophic failure of the glass with violent discharge of hazardous high velocity steam. The discharge of high velocity steam can result in personal injury and property damage may occur. 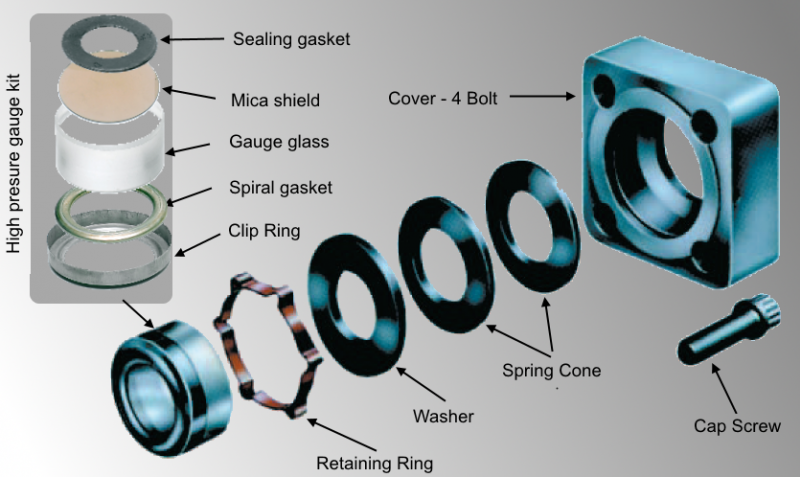 We recommend each customer establish a preventative maintenance schedule which insures the mica-gasket-glass assembly is replaced previous to the dissolution of the mica shield. 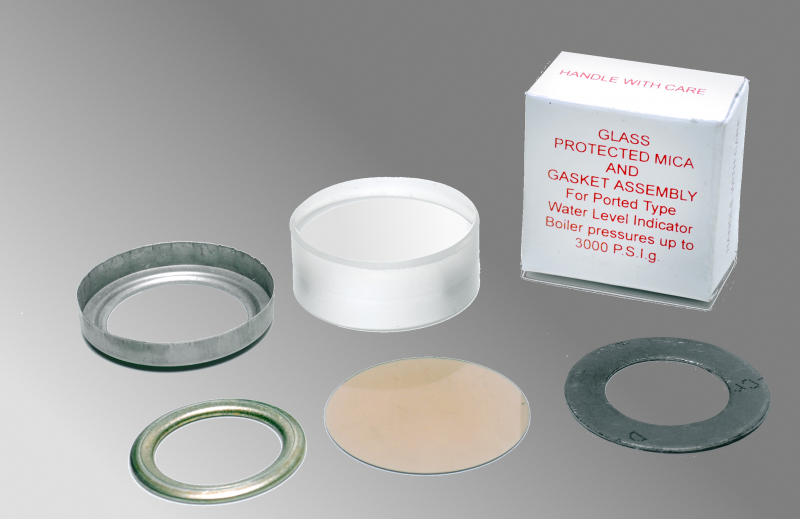 In-service gauges that have glass which appears white or is opaque, should be isolated immediately and the mica-gasket-glass assembly should be replaced before returning to service. 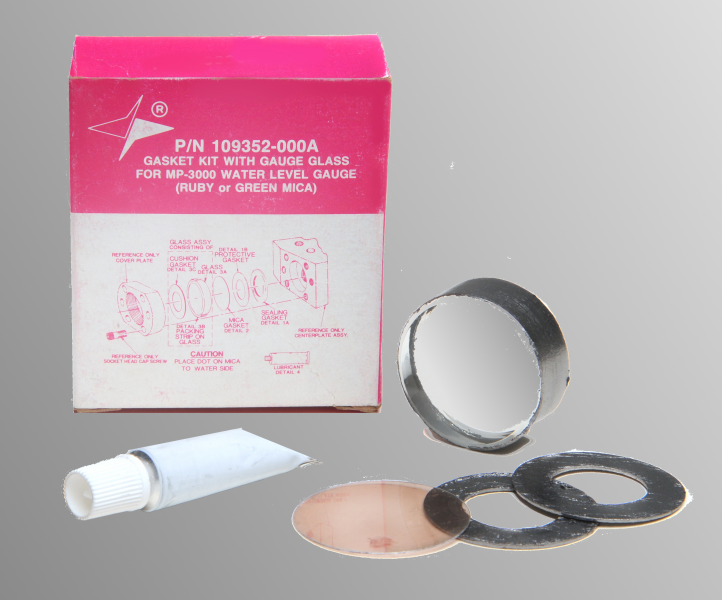 Complete set of high pressure gauges, consist of viewing elements (glass, mica shield) and a fixing sealing. 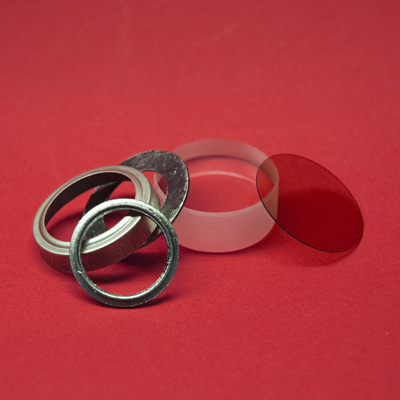 To reduce the effect of internal light reflection from the edge of the glass, in some solutions wrapping the edge of the glass by graphite film layer is applied. 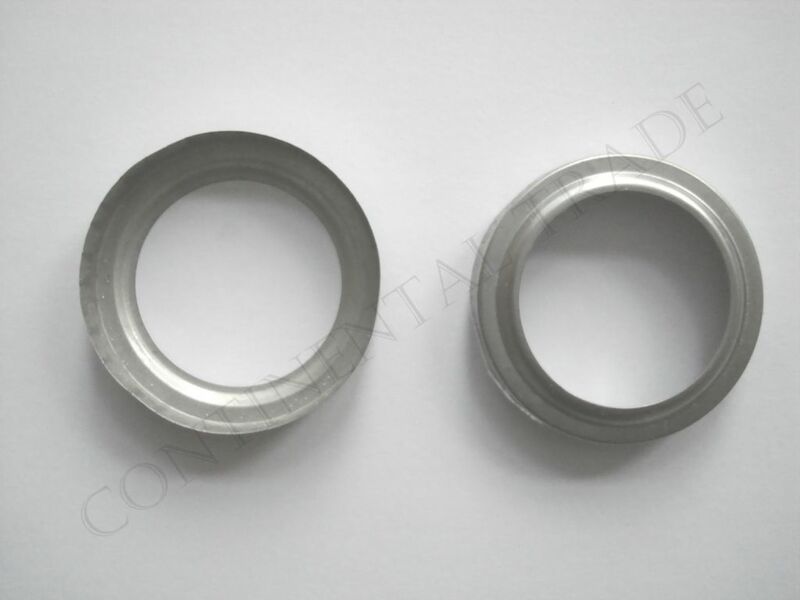 Glasses, which are elements of high pressure gauges kits are made from borosilicate or aluminosilicate glass, depending on the operating conditions and user requirements.